John was born in Turin, in the Piedmont region of Northern Italy, to a peasant family. His father died when John was only two years old, leaving he and his two brothers in the solitary care of his mother. The family, quite poor, struggled to make ends meet, and John began to work as soon as he was old enough to correctly manipulate tools. He also demonstrated piety and devotion to the Lord from an early age, and professed his wish to become a priest at the age of nine, following a dream. His goal, even from that early age, was to assist youth who suffered in the same manner in which he did. John wished to spread the word of the Gospel, even as a child. He demonstrated great initiative and creativity and learned magic tricks and acrobatics in an attempt to gather an audience so that he could later evangelize and catechize the children and adults of his town. He would begin with a prayer, and while he still had a crows, would often repeat the homily he had heard in church earlier in the week. His mother approved his wish to become a priest, but to make that happen, John would have to leave home to receive an education in the city. Being larger than his peers, and noticeably more impoverished, John was the constant focus of his classmates’ ridicule and teasing. To pay for his education, John spent his evenings working in whatever capacity he could—as a tailor, cobbler, and a waiter—returning back to his small room to study through the night be candlelight. Upon graduation, he began his studies for the priesthood. 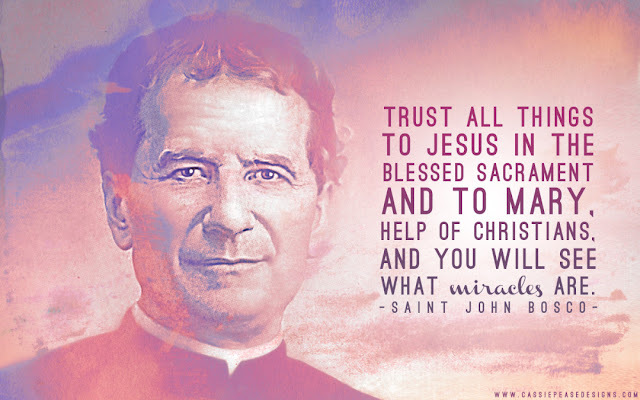 Quote to SHARE by St John Bosco "There are two things the devil is deadly afraid..."
Like most things he set his mind to, John Bosco was ordained a priest at only twenty-six. During his time as a seminarian, he devoted his spare hours to looking after the urchins who roamed the slums of the city. Every Sunday he taught them catechism, supervised their games and entertained them with stories and tricks. He spent weekdays recruiting the roughest and dirtiest he could find, inviting them to the Sunday gatherings. Before long, his kindness had won their confidence, and his “Sunday School” became a ritual with them. Upon ordination, Saint John immediately sought to formalize his ministry to the poor boys of the city, opening a hospice. When he was unable to secure a building in a “good” section of town, he took one in the slums. This first “oratory” was soon joined by three others, as educators and religious sought to join him in his ministry. His mother joined him as well, serving as housekeeper. Saint John fed and clothed the boys, but also spent long hours providing them with a basic education, and teaching them skills to obtain employment. Within the hospice was a tailoring and shoemaking room, as well as a printing press. Above all, he instructed the boys in the Gospel, modeling by example the life of Jesus Christ, and creating the atmosphere of a Christian family built on trust and love. Noting the transformation of the youth he ministered to, Don (Father) Bosco began to gather followers to him, who accepted him as their spiritual advisor, leader, and guide. As their number grew, the Salesian Society of priests and lay brothers was formed. Named after Saint Francis de Sales, noted for his gentleness and kindness, Saint John Bosco dedicated this new society to the saint. Saint John traveled to Rome in 1858, and met with Pope Pius IX who encouraged his new religious community. Four years later, he founded an order for women, The Daughters of Mary, Help of Christians, to care for abandoned girls in the same manner. By 1868, over 800 boys were being cared for in the Salesian oratories. Along with this, Saint John oversaw the writing, printing and distribution countless pamphlets that popularized Catholic teaching and answered the objections of anti-Catholics. Moreover, he was reported to receive supernatural guidance from the Lord, it the form of vivid dreams and visions, many of which he recounted. At times, he was able to predict the deaths of those he was close to, revealed by God, so that he might provide Last Rites. He also received a vivid vision of Hell, which he shared with all he encountered. Saint John is also remembered for working miracles, especially the multiplication of food when funds were short.